When Mikal Bridges (25) and Villanova go cold from three, their defense becomes a huge liability. Photo by Gavin Baker/Icon Sportswire. There is no truly elite team in college basketball this year. Each of the favorites has significant flaws. Yes, even Duke. What will hold the frontrunners back from a national championship? If history is any indication, a team is going to win the 2018 national championship, but it’s a lot easier to make a case against the favorites than for them. From horrible defense to ice-cold shooting, from inexperienced point guards to PED suspensions, every March Madness frontrunner has its issues. Welcome to 2018, the year when no team has what it takes. 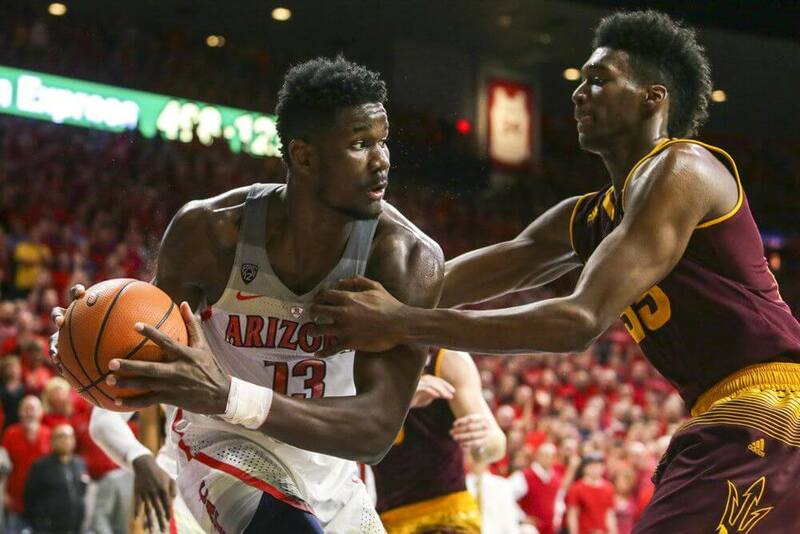 Arizona has 99 problems, but Deandre Ayton (19.9 PPG, 11.2 RPG) isn’t one. Photo by Jacob Snow/Icon Sportswire. You’ll learn below that defense doesn’t win championships in college basketball. But a bad defense sure will lose it for you. The last team to win the title with a defense that ranked outside the top 15 on KenPom was North Carolina in 2009. The ’09 Tar Heels finished 18th in that metric, the lowest any national champion has finished since 2002 (which is as far back as KenPom goes). Right now, Arizona’s defense is a little outside of the top 20. It’s 98th. That’s 80 spots lower than the worst national champion ever. The defensive woes early in the season were supposed to fade when Rawle Alkins returned to the lineup. They haven’t. Arizona’s defense … [ranks] 80 spots lower than the worst national champion ever. And now star guard Allonzo Trier (19.6 PPG) is in jeopardy of missing the rest of the season due to a failed drug test. Without Trier, Arizona isn’t worthy of a spot on the list of potential contenders. Are Marvin Bagley and Duke too young to win a title? Photo by Jaylynn Nash/Icon Sportswire. Expecting this section to lambaste the Blue Devils’ defense? Coach K’s willingness to go zone can mask enough of those issues. This team has a bigger hurdle in its national championship quest: they are starting a freshman point guard, Trevon Duval. 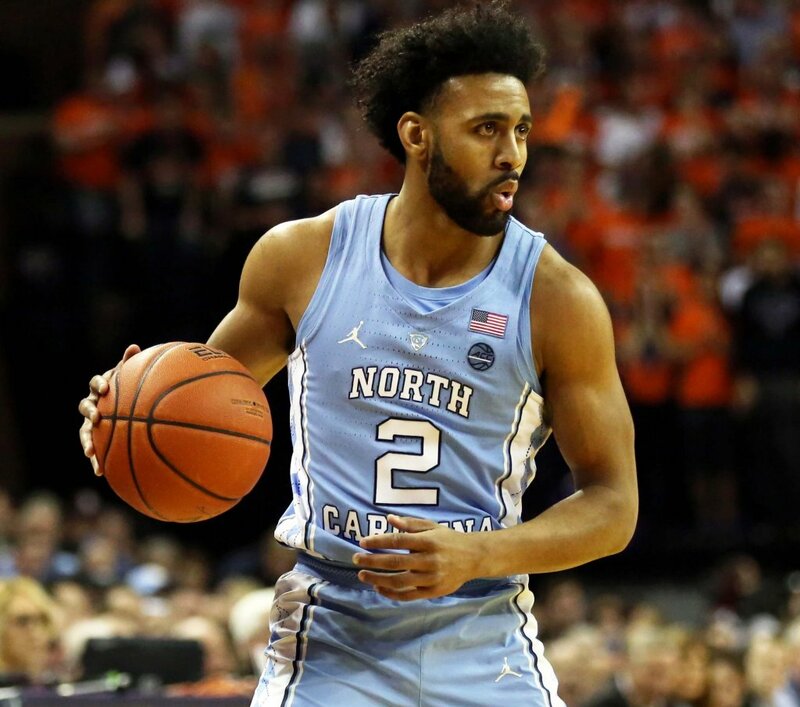 The starting point guards on the last five national champions were: Joel Berry (UNC, 2017: junior), Ryan Arcidiacono (Villanova, 2016: senior), Quinn Cook (Duke, 2015: senior), Shabazz Napier (UConn, 2014: senior), and Peyton Siva* (Louisville, 2013: senior). The 2012 Kentucky Wildcats were the last champion that had a freshman as its primary ball-handler (Marquis Teague), and that team also had two lottery picks (Anthony Davis, Michael Kidd-Gilchrist), two more first-rounders (Terrence Jones, Teague), and six total players who were selected in the 2012 NBA Draft. Grayson Allen goes into incognito mode when [Marvin] Bagley is on the floor. While Marvin Bagley is tremendous, he is not the second-coming of the Brow, a transcendent, once-in-a-generation talent who dominated at both ends of the court. Plus Grayson Allen goes into incognito mode when Bagley is on the floor, and there’s a statistical argument to be made that Duke has been better when Bagley has been injured. 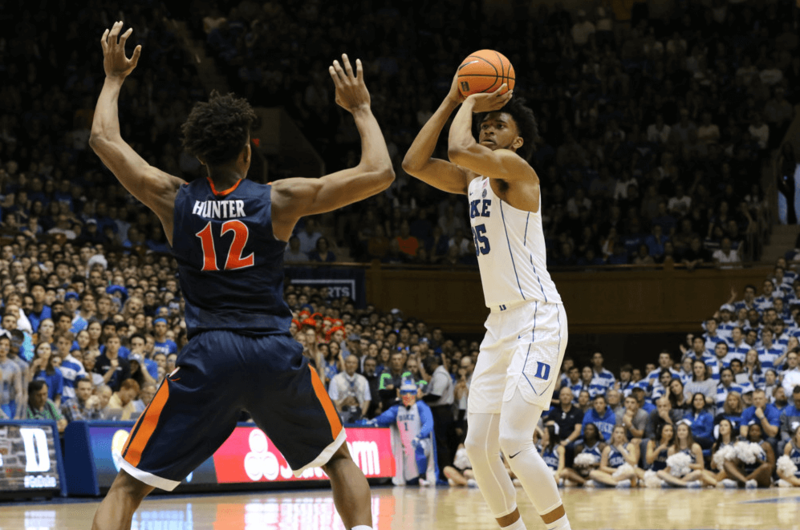 Reason for optimism: Coach K has opted to have Grayson handle the ball more down the stretch, and he’s looked more comfortable as the primary than when they tried this experiment in years past. Hope springs in Durham. *We still consider Louisville the 2013 champion. Having Udoka Azubuike as your starting center is fine. Having Udoka Azubuike as your only real frontcourt presence is not. Even if the Jayhawks go small, the 7’0 Nigerian can’t stay on the court all night (24.0 MPG), and behind him on the depth chart is Mitch Lightfoot, a 6’8 sophomore who was supposed to be an afterthought. But the season-long suspension of five-star freshman Billy Preston (who’s now playing in Bosnia) has forced Bill Self to play Lightfoot nearly 15 minutes a night. 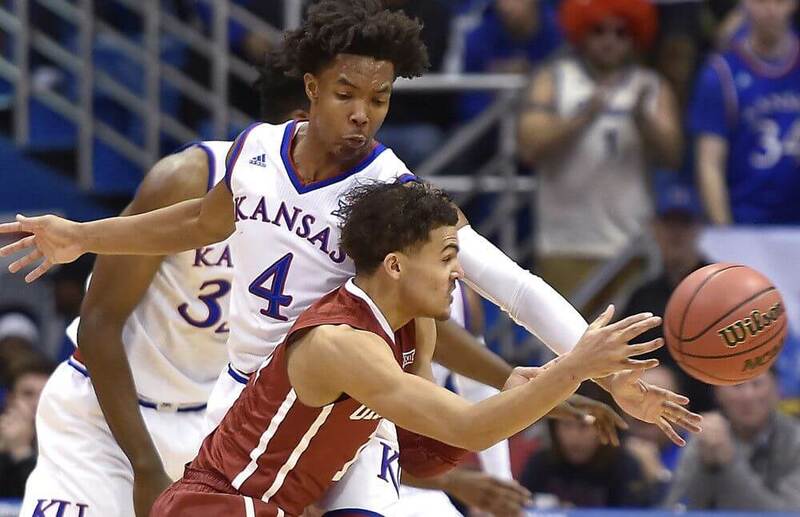 In the guard-centric Big 12, Kansas has been able to survive, even thrive, winning a ludicrous 14th straight conference title. When they meet a team like Michigan State or Duke, though, they are going to get obliterated in the post and dominated on the boards; they don’t have the perimeter shooting (39.7% from three) to make up for it, unless Devonte Graham goes full Mario Chalmers. Miles Bridges (22) drives to the basket during an exhibition college basketball game between Michigan State and Ferris State on October 26, 2017, at the Breslin Student Events Center in East Lansing, MI. Michigan State defeated Ferris State 80-72. Photo by Adam Ruff/Icon Sportswire. “Too many turnovers” is a euphemistic way of saying Sparty’s guard-play is not good enough. MSU averages 13.34 turnovers per game and has a miserable 0.31 steal-to-turnover ratio, which is 340th out of 351 teams. While they have a great three-point percentage, they only attempt 20 per game, which is outside of the top 200. MSU averages 13.34 turnovers per game and has a miserable 0.31 steal-to-turnover ratio, which is 340th out of 351 teams. 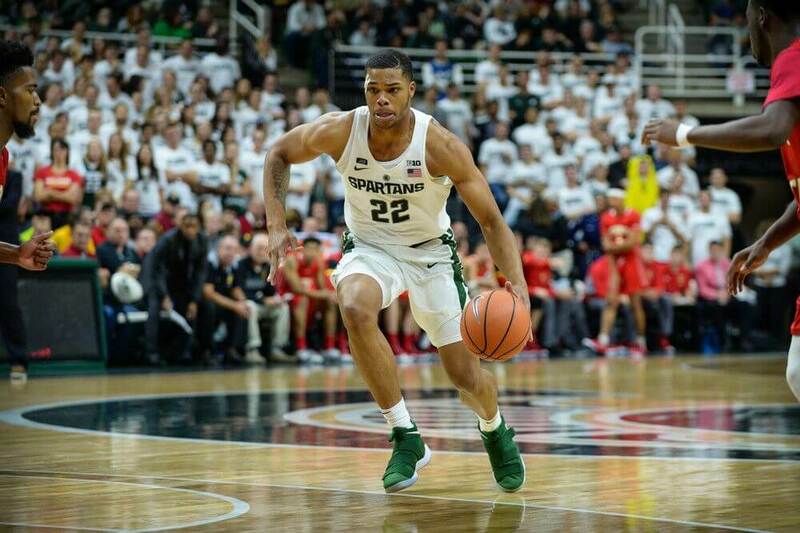 When Winston is on his game, the Spartans’ offense rolls; they have the best and deepest frontcourt in the nation and pairing it with above-average guard play is a deadly combination. But when Winston struggles, so does the team, as its frontcourt edge is not properly utilized. This showed up in brilliant technicolor when MSU lost to Michigan at home (82-72). The Spartans lost the turnover battle 18-7 and lost the game by double digits, despite grabbing more rebounds and shooting at a higher percentage from the field. The good news for MSU is that Winston has been getting better as the season progresses. He scored in double figures and had at least five assists in Sparty’s last five regular-season games, while only committing 11 total turnovers. Joel Berry’s Tar Heels can shoot themselves out of any game. Photo by RyanHuntMuzik (Wikipedia) [CC License]. This section could be extremely short: Luke Maye is the Tar Heels’ leading scorer (18.0 PPG). That’s not something that will ever be true of a national-championship winning team. Need more? UNC shoots a mediocre 37% from three and has put on some of the worst shooting performances in school history this season. They shot 24.6% from the field and 5.6% from three in an embarrassing 63-45 loss to Michigan State. They were held under 50 points and under 30% from the field by Virginia as well (61-49). Oh, and they lost to Wofford in Chapel Hill. Is the key to beating Purdue to funnel the ball to Isaac Haas? Photo by Michael Allio/Icon Sportswire. To Purdue’s credit, it’s hard to figure exactly why they can’t win it all. They’re balanced on offense and defense; they don’t rely on freshmen; they shoot well from deep and have a tremendous post-presence in Isaac Haas. Yet, late in the Big 12 regular season, Matt Painter’s boys went on a three-game losing streak, including tight losses to Michigan State and Ohio State, and a puzzling 57-53 setback to Wisconsin. It seemed like they had been figured out, and they might have been. Purdue’s early-round opponents likely won’t have the frontcourt to make Haas uncomfortable, but any team with a few bigs to cycle through will give Purdue problems. Over 40% of the Boilermakers’ field-goal attempts on the year are from three, and they hit at an ungodly 41.7% rate. But when they faced the Buckeyes and Spartans, both teams made a concerted effort to take away the three and force the ball inside to Haas. 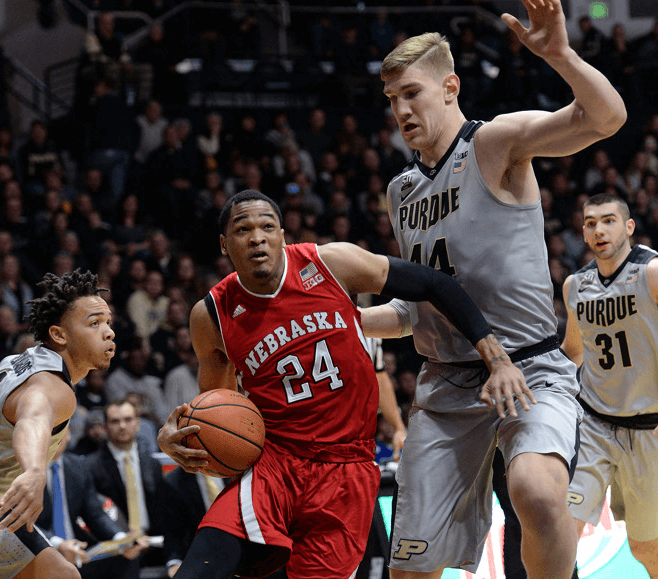 Haas is a 7’2″ behemoth and a matchup nightmare for most teams, but if you make him work for 40 minutes and limit Purdue’s offense to seven/eight-footers, the results are a marked decrease in efficiency. Purdue’s early-round opponents likely won’t have the frontcourt to make Haas uncomfortable, but any team with a few bigs to cycle through will give Purdue problems. 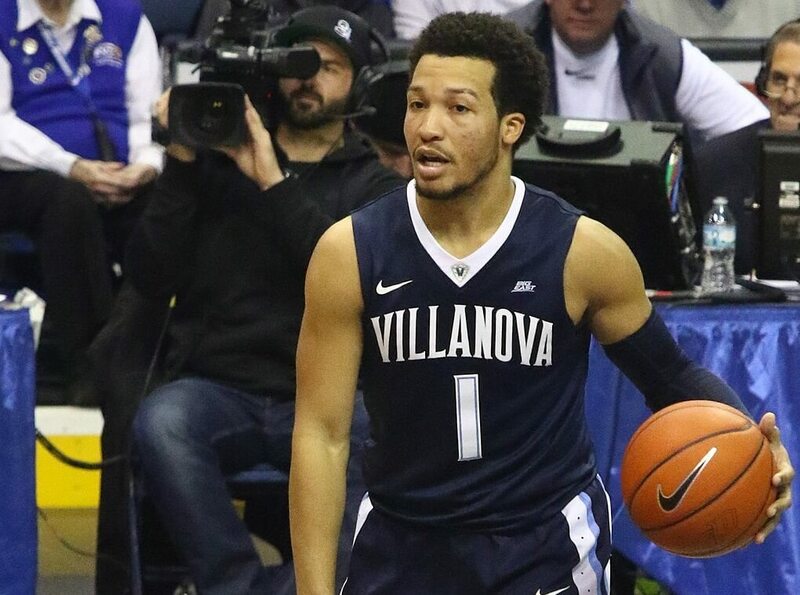 Guards Vincent Edwards and Carsen Edwards, who feast when opponents focus on Haas, have struggled when they get more of the attention. Thanks to a suspect defense, Jalen Brunson’s Wildcats are liable to get picked off in the tournament if they have an off night shooting the ball. Photo by Tony the Tiger (Wikipedia) [CC License]. The Wildcats are basically the college version of the mid-2000s Suns. They have an electric offense, but don’t offer much resistance on D and are extremely vulnerable when they’re not hitting from deep. Jay Wright’s squad takes 28 threes per game (most among power conference teams) and, admittedly, hits at a solid 40.5% clip. But every team that relies so heavily on its perimeter shooting has off nights, and when the Wildcats go cold, they lose to the likes of St. John’s … at home. Winning the national championship means winning six games in a row. (Breaking news!) Are you willing to wager that Nova will stay hot from beyond the arc for the better part of 240 minutes? 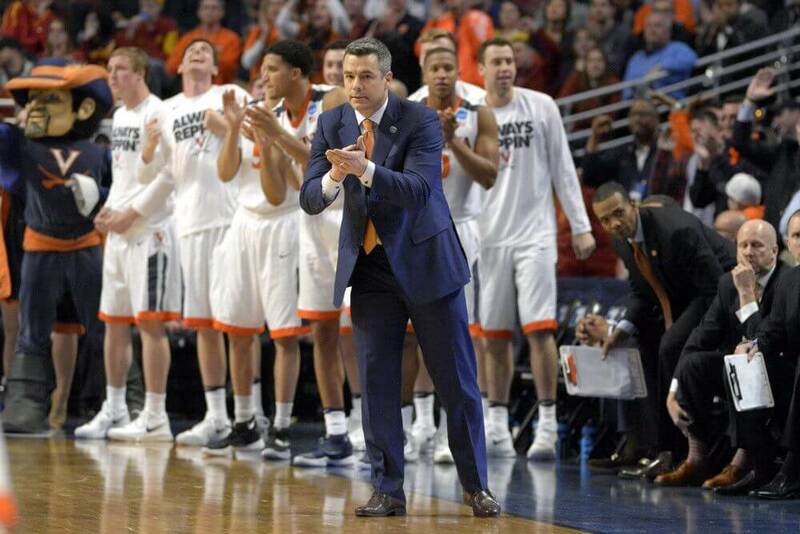 Tony Bennett has never led Virginia past the Elite Eight. Photo by Robin Alam/Icon Sportswire. Virginia is the anti-Villanova: stout defensively, but incredibly suspect on offense. They have been held under 60 points six times already this season, including a 49-point effort against Wisconsin, a team that barely cracks the top 100 in defensive efficiency. Defense does not win championships in the NCAA. Since 2003, only UConn (2014) has won the national title without a top-ten offense (per KenPom), and that required a superhuman effort from Shabazz Napier, who proceeded to take his talents to South Beach. Since 2003, only UConn (2014) has won the national title without a top-ten offense. *Kyle Guy shaved his man-bun for the 2017-18 season. The betting impact of this decision is TBD.